Progressive cities across the world do retain ownership and trade bulk rights in order to capture and redistribute the value of land for the benefit of all residents – but it would seem this is not supported by the current policy and legislative framework. This week, Mayor Patricia de Lille requested City of Cape Town manager Lungelo Mbandazayo to initiate a forensic investigation into Site B, prime public land on the Foreshore, auctioned to Growthpoint Properties in 2016. In fact, Ndifuna Ukwazi wrote to the city manager two weeks ago requesting the investigation after we published key documents online exposing how residents of the city may have lost up to R140-million, money that the City itself said was committed to provide basic services and housing for poor and working class people across the city. Our investigation into how this happened raises serious questions about the competence of City of Cape Town officials and politicians to govern and whether they understand the transformative potential of public land at a time when the nation is rightfully angered by the lack of land reform, redistribution and restitution. 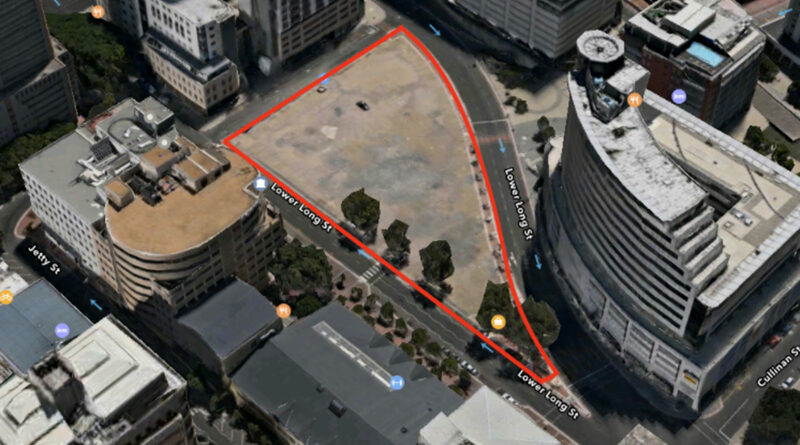 In September 2018, the City of Cape Town gave notice in local newspapers of an application by Growthpoint Properties to develop Site B. Growthpoint submitted plans to develop a 100-metre skyscraper which will include retail, conference facilities, offices, two hotels, a sky bar and restaurants. Growthpoint, listed on the JSE in 1987, is now the 21st largest company in the FTSE/JSE top 40 index. The company owns 547 buildings across three continents, including a 50% stake in the V&A Waterfront, and has an asset value of R122.3-billion. Interestingly, Growthpoint already owns the adjacent buildings where the ENS and Investec offices are located. The Government Employees Pension Fund is the largest shareholder with a 12.4% stake. What caught Ndifuna Ukwazi’s eye in the notice, however, was that Growthpoint was asserting that it already had the rights to 46,000m2 of bulk on the land – enough to build the skyscraper. We remembered that the maximum permissible bulk advertised at the time of the auction was 17,500m2. The bulk or floorspace of a development is the volume of the building. The maximum permissible bulk allowed has implications for the price that property developers are willing to pay because the more floor space they are allowed to build, the more they can rent or sell for profit on the same size piece of land. Site B was public land owned by the City of Cape Town. The City subdivided the old power station on the Foreshore into smaller parcels after the power station was decommissioned. These smaller parcels were then registered in April 1996, and a rezoning substitution scheme came into effect which granted Site B 17,500m2 of bulk rights with a height restriction of around 60 metres. However, a month later, in May 1996, the then Premier Hernus Kriel increased the bulk rights in an amendment to the conditions ahead of a consolidation of the land with Site A to the South. The consolidated land (Erf 158112) was called Site AB and granted a total of 69,000m2 of floating bulk rights, which was also confirmed in the title deed restrictions. In 1997, Site AB was sold to a French company, the Compagnie Generale de Batiment et de Construction. Strangely, no price is listed in the title deed and mysteriously the same land was sold back to the City three years later in 2000 for R27-million. This was then swiftly subdivided into Site A (Erf 165637) and Site B (Erf 165639) for a second time. In 2004, Site A was sold to a company called Coessa, and planning approval was granted by the City to develop an exclusive residential tower called “The Icon”. What is important here is that the amended bulk rights across both parcels of land remained at 69,000m2. “The Icon” on Site A used up 22,896m2, leaving the remainder of 46,104m2 on Site B. A zoning certificate confirms this. In 2011, permission was obtained from Council to dispose of Site B. Unfortunately, the reports that should be attached to the Council minutes are not available online, and so it is impossible to tell whether Council was provided with an evaluation of the land. The City advertised Site B then and again in 2015, but failed to award the tender. It is unclear why this is. Perhaps the low bulk rights advertised was seen as unfeasible. The land was then put up for auction in 2016 by Aucor. At the time, Ndifuna Ukwazi actually wrote to the City asking why the land could not be used for affordable housing, why it was auctioned. In a response a month later, Ruby Gelderbloem, Director for Property Management, stated that the site was not needed for a minimum of basic services. “The disposal programme leverages the City’s assets to enable social and economic opportunities across the city,” she said. The land was auctioned for R86.5-million (before tax), but in the prospectus the maximum permitted bulk was set at 17,500m2, the amount granted before the 1996 amendment came into effect. This is important. At R86.5-million for 17,500m2, Growthpoint ostensibly paid R4,942 per bulk m2, which would have been a fair price for prime land in the inner city and surrounds. Over the past few years, inner city land has sold for between R4,000 and R5,000 per m2 and sometimes much higher. However, in reality, with 46,104m2 bulk rights, Growthpoint paid closer to R1,880 per bulk m2 which is less than half the price. In effect, Growthpoint was given a discount on some of the most valuable land in our city. Had Growthpoint paid a market price, we estimate the land could have sold for between R185-million and R240-million, leaving the City out of pocket by up to R140-million, and not the R58-million that the Mayor is now quoting. Which begs the question, who knew and who is responsible? Ruby Gelderbloem (Director of Property Management), Kevin Jacoby (Executive Director for Finance at the time) and politicians like Ian Neilson (MayCo member for Finance at the time) were responsible for managing and disposing of the City of Cape Town’s land and they have serious questions to answer. Initially, Stuart Diamond, the current MayCo member for Assets and Facilities Management, doubled down on the City’s position that the permissible bulk is 17,500m2. Then Ian Neilson issued a second entirely different response, confirming that the 46,000m2 is available but arguing that Growthpoint only bought 17,500m2 of the bulk rights and that the remainder would need to purchased. In our opinion, if the City were able to own and sell bulk rights it would fundamentally change the land and property regime as we know it in South Africa. This would be welcome – progressive cities across the world do retain ownership and trade bulk rights in order to capture and redistribute the value of land for the benefit of all residents – but it would seem this is not supported by the current policy and legislative framework. Growthpoint itself has changed tack. Initially the CEO for Growthpoint in South Africa, Estienne De Klerk, stated that they would be meeting with the City to ascertain if “more funds needed to be paid”, but by the end of September the Group CEO, Norbert Sasse, took the position that the company believed the price it paid was more than fair. Growthpoint contracted two consultants to write up and submit the development application for the skyscraper on Site B: Japie Hugo and Nigel Burles. Japie Hugo used to work for the City of Cape Town when the site was given rights and when it was sold. He was the Director of what was then called Planning and Environment from 1994 to 2005. Site B was granted the additional rights in 1996. After an interlude working in the privates sector, Japie Hugo was then appointed Executive Director for Energy, Environment and Spatial Planning at the City of Cape Town from 2012 to 2017. The property was auctioned in 2016. Nigel Burles runs his own town planning consultancy. He is also a member of the Municipal Planning Tribunal and has sat on the Northwest panel which hears applications from Blaauwberg to the inner city. The Municipal Planning Tribunal is an independent body established under SPLUMA to adjudicate on land use decisions and advance the principles of spatial justice, spatial efficiency and spatial sustainability. Site B will eventually be heard by the Northwest panel of the Municipal Planning Tribunal. Members are required to recuse themselves if there is a perceived or actual conflict of interest. What has been sorely lacking to date is an honest account of exactly what happened. Both the Province and the City of Cape Town have a history of selling prime property for cash. The officials and politicians who act as custodians of public land do not seem to understand the state’s obligation to redress spatial apartheid and advance the right to housing. When this is absolutely impossible and land is sold, government must secure a fair market value. Jared Rossouw is a co-director and Nick Budlender is a researcher at Ndifuna Ukwazi, an activist organisation campaigning for land justice and affordable housing in Cape Town.